An African-American friend painted Biko’s face on a T-shirt along with the words, Cry Freedom, then gave it to me. I wore it at various vigils including one at a bank with money invested in South Africa. We read the names of people killed under the apartheid regime, including the name of Stephen Biko. A death and a funeral said so much about who this man was and the evil system against which he struggled. He died alone, naked, shackled, battered and bloodied in the back of a police van that took a long, slow trip so he would die on the way to the hospital. He was a black man in the hands of white police officers. Twenty thousand mourners attended his funeral even though police had blocked roads and driven thousands of people away. The story of his death would spread his teachings around the globe, bringing one more huge indictment against the murderous regime that tried to silence him. His name was Stephen Bantu Biko. He died at 30 years of age in 1977, but already he had become a champion for his people. He founded The Black Consciousness Movement to resist the apartheid regime in South Africa. His family supported Biko in the effort to improve his lot through education. But when he was a child, the South African government passed the Bantu Education Act that sought to limit education of blacks so that they would not be able to aspire to anything that did not include back-breaking labor. The author of the Act said, There is no place for him (the Bantu or black) in the European community above the level of certain forms of labor. Faced with legislated limits on his education, Biko began to grow in his political awareness. His brother was arrested and jailed for nine months on suspicion of being connected with the military wing of the Pan Africanist Congress. Biko was interrogated and expelled from school, leaving him with a strong resentment toward white authority. Despite the government’s legal suppression of education resources, Biko struggled to continue his education in both law and medicine, first at a Catholic school and later at the University of Natal. Despite all the structural discrimination he encountered, his political activism took shape. He began seeing that the consciousness of blacks under the oppressive system of apartheid was one of the key problems to be addressed. He said, The most potent weapon in the hands of the oppressor is the mind of the oppressed. So he sought to change that mindset. He encountered racism and paternalism in the National Union of South African Students (NUSAS). The NUSAS was open to students of all races, but he saw that blacks were not being allowed by the white students to assume leadership positions so he founded an all black, pro-black student group called the South African Students’ Organization (SASO). Under Biko’s leadership SASO adopted the doctrine that became known as Black Consciousness and began promoting it throughout the country. SASO provided legal aid and medical clinics for poor blacks as well as promoting small-scale industry to build up the economic base in black communities. As The Black Consciousness Movement spread beyond the campuses, Biko helped launch the Black People’s Convention (BPC) to give structure to the movement in non-student contexts. The BPC grew to be a coalition of over 70 groups that embraced Black Consciousness. 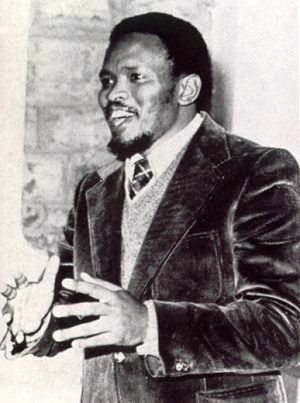 Biko was elected the president of the BPC, which led to his expulsion from medical school. The basic tenet of Black Consciousness, according to Biko, is that the black man must reject all value systems that seek to make him a foreigner in the country of his birth and reduce his basic human dignity. Biko was not anti-white, but he did stand against forms of racial oppression, even from liberal whites who, despite their open-minded views, wanted to limit black leadership. He sought to break the chains of inner inferiority that blacks had given into under the weight of years of oppression. He taught that everyone—black and white—must realize and act upon basic humanity. As Biko put it: As a prelude whites must be made to realize that they are only human, not superior. Same with Blacks. They must be made to realize that they are also human, not inferior. He would say, Man, you are okay as you are; begin to look upon yourself as a human being. Such teaching was too explosive for the controlling white apartheid regime to tolerate. Biko was banned, which meant that he was restricted to his home district in King William’s Town; he was not allowed to teach, to speak to more than one person at a time, to be published, or to attend any educational institution. He also had to report weekly to the local police. In spite of the ban, Biko was able to continue organizing the movement and to set up a rural health clinic outside King William’s Town for poor blacks who were not given access to city hospitals. He helped establish the Zimele Trust Fund to assist political prisoners and their families. He also continued to write for the SASO newsletter under the pen name Frank Talk. In June 1976, Soweto erupted in protests as students rejected the government’s demand that they be educated in Afrikaans, which they viewed as the language of the oppressor. The students went on strike, stirred by the teachings of Black Consciousness and the work of the BPC. In a confrontation with protesting students, police opened fire. The rioting and police violence lasted for two days. The world was shocked at the brutality of the repression. Nobody knows how many people were killed, but international news agencies put the death toll at more than 500. As the leader of the movement to raise consciousness, Biko was targeted for more serious treatment. On August 21, 1977, he was arrested under the Terrorism Act, which had been used to jail many black activists. Biko was brutally treated while in police custody. He was beaten on the head, and according to police reports began exhibiting signs of neurological injury as early as September 7. His condition was ignored for days, as he was kept naked and chained to a metal grille. Finally a police physician recommended that he be transferred to a hospital. Though he was in detention in the sizable city of Port Elizabeth, he was taken, still chained and without even rudimentary medical treatment, in the back of a police Land Rover for a 1,200-kilometer journey to Pretoria. They drove slowly for hours as he bled to death from his internal injuries. Police brutality continued at Biko’s funeral as police hauled people off buses and beat them with truncheons. Biko’s funeral went on for a long time, becoming an angry protest rally. The international criticism over Biko’s death eventually prompted an inquest, but the police investigators said Biko died of self-inflicted causes. Nobody was held responsible. White journalist Donald Woods had known Biko and was able to take photos of his injuries at the morgue, images that Woods then smuggled out of the country. In exile, Woods wrote a book titled Biko, later followed by the movie Cry Freedom, which gave international prominence to Biko’s work and martyrdom. After the fall of the apartheid government and establishment of majority rule in South Africa, the Truth and Reconciliation Commission found that Biko’s death was a gross human rights violation. Law enforcement officials were found responsible for his death, but they had agreed to testify under the provision of amnesty that the commission gave as part of their regular procedures. We have set on a quest for true humanity, and somewhere on the distant horizon we can see the glittering prize. Let us march forth with courage and determination, drawing strength from our common plight and brotherhood. In time we shall be in a position to bestow upon South Africa the greatest gift possible—a more human face. Whatever human face is possible today in South Africa is a result in great part from Stephen Biko’s vision and sacrifice.